Results & Discussion: For the development of the HFF piezoelectric immunosensor, 100 MHz quartz crystals were used as transducer elements. The gold electrode surface was functionalized by covalent immobilization of the target biomarker through mixed self-assembled monolayers (mSAM) of carboxylic alkane thiols. A competitive immunoassay based on Myc-31 MAb was integrated with the transducer as sensing bio-recognition event. Reliable assay signals were obtained using low concentrations of antigen for functionalization and MAb for the competitive immunoassay. Under optimized conditions, the HFF immunosensor calibration curve for 38 kDa determination showed a limit of detection as low as 11 ng mL-1 of the biomarker. The high detectability attained by this immunosensor, in the picomolar range, makes it a promising tool for the easy, direct and sensitive detection of the tuberculosis biomarker in biological fluids such as sputum. Keywords: Tuberculosis, 38 kDa Biomarker, Monoclonal Antibody, ELISA, High Fundamental Frequency (HFF), Piezoelectric Immunosensor. 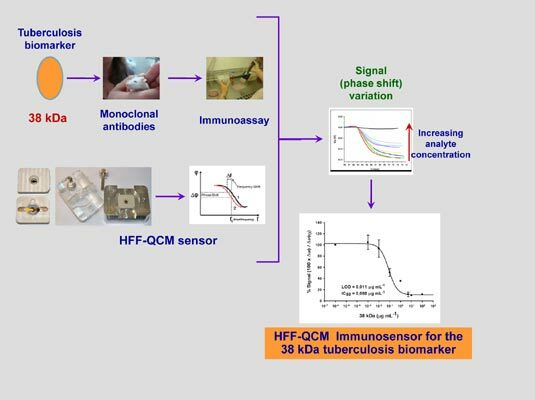 Keywords:Tuberculosis, 38 kDa Biomarker, Monoclonal Antibody, ELISA, High Fundamental Frequency (HFF), Piezoelectric Immunosensor. Abstract:Background: Tuberculosis, one of the oldest diseases affecting human beings, is still considered as a world public health problem by the World Health Organization.